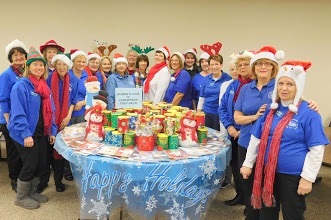 The Woman’s Club of Parsippany- Troy Hills just held its Annual Candy and Cookie Meeting and wrapped over 175 tins of holiday goodies for area nursing and care homes. The cookies have been donated to residents of Sunrise Assisted Living Facility, the Country Home, both in Morris Plains, and the Eric Johnson House in Morristown. Operation Cookie/Candy has been a project of New Jersey Women’s Clubs for over 50 years. Another recent holiday project of the club is Boatsie’s Boxes. Club members filled 56 Christmas stockings with toiletries, games, telephone cards and other items for members of the military serving overseas. vAnd in December club members will be donating clothes, toys and other gifts to a family in the Head Start Community Program of Morris County.